The painting is well known. Jules Bastien-Lepage painted this study of a blind boy, ill clothed, sleeping in an alley sometime around 1868. 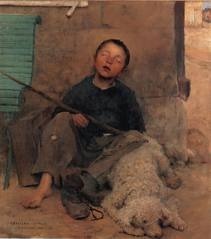 The boy is pictured holding a crude cane and he’s accompanied by a sheep dog who is also asleep. The dog is not a guide dog but you can bet that if someone tried to steal the boy’s meager earnings he would bark. Night is still with the boy and he’s hard asleep. Only the painter knows that morning has come. In this way the painting is voyeuristic. The boy’s mouth is half open as he sleeps. Soon the sun will emerge from behind the houses. And soon the boy will wake up and resume his repetitive cries. Meanwhile Bastien-Lepage means for us to stare. But I am interested in the boy’s dreams. In sleep he is fetching water. There is a blue light radiating from the village well. He knows the word for blue and in sleep he understands what it is. Blue is the precursor to seeing. In his dream he feels he is very much alive. The leaves whisper from their dark places in the medieval city.